Ultramundane level of training methodology. Italian Fencing School. 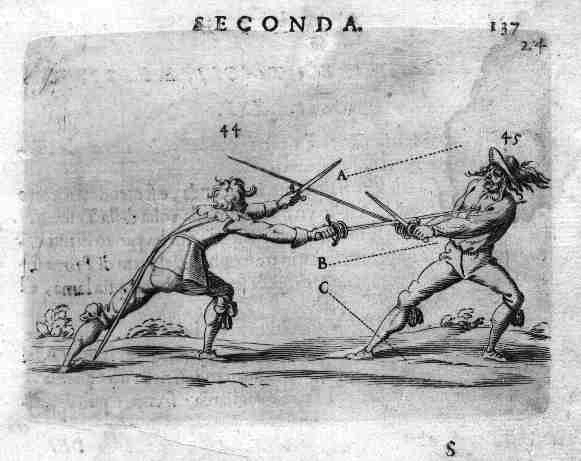 To conclude the first block of explanations on Italian fencing with Grand Maestro Maltsev Oleg we are going to look at the greatest work of the master and a scientist in the field of martial arts Francesco Alfieri – “The Art of Excellent Handling of the Sword” 1640 (published in 1653). Therefore, we need to find out what kind of contribution did Francesco Alfieri in the field of fencing, and for what reason he is honored by so many and why has he remained in the global history as an outstanding master? “It was a great pleasure for me to read the book on weapons by Senor Francesco. I perceived the foundational doctrine and felt this very fine line of the revitalization of my Animo. I am honored to receive all these advantages from studying the art of weapons. I testify that Senor gave me a wisdom of his brilliant mind.This is only the smallest praise of his dignity, honor and immortal fame. In this way, next generations of knights can enter into this deadly life.This story is written in a cursed language, which passed the full wisdom of handling the weapon. It is an extreme language, language of the heart, in which all natural causes are entrenched, and thus the fear of man goes away, thus I got into a maze of curses with evil judgments and dishonor. Nevertheless, at the end, I kiss the hands of my master and I thank heavens forever every single time.” June 20, 1653. Fig. 2. Title page of the treatise “The Art of Excellent Handling of the Sword”. Written by Francesco Alfieri. What Francesco Alfieri did as a representative and master of the Venetian Fencing School for Italian and world fencing? It has to be kept in mind, that at that time Venice was not part of the Italy, it was a separate state and the Venetian fencing school had no relation to Italy. And in the ancient treatises of the 19th century it is stated that the Italian school did not exist at that time. Besides, this very treatise was exactly what has influenced the formation of the Italian school. We see that Alfieri writes about how he formed a new, universal combat position which is superior and different from all previous ones ever formed. One has to consider, that this book cannot be read in one breath, otherwise you will have to return and disassemble every detail. The book is full of many illustrations in the Venetian manner, which allows one to get acquainted with everything in detail. It is worth noting that the treatise is written in two parts. 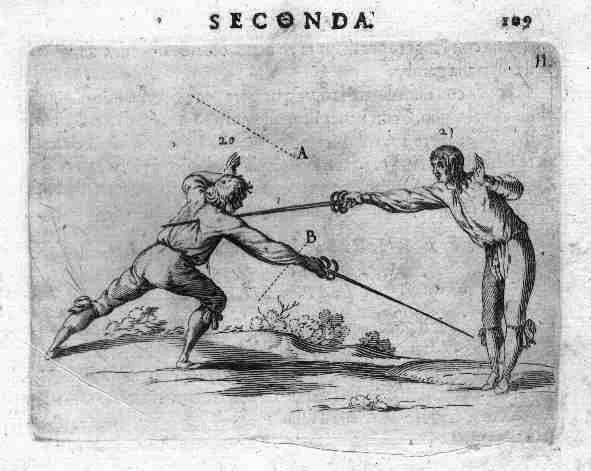 Francesco Alfieri in the first chapter divides fencing into two types: Norman and Greek. This is the 1st classification which appears in the documents. Alfieri is a “sheer Venetian”, he resided in Padua, a place which was the center of science in those days – the University of Padua. Indeed, this master employs a scientific point of view when approaching the art of fencing. What was the reason he had introduced the classification of the Norman and Greek fencing? It is because in all rest takes its origin from these two directions. Dexterity includes also flexibility, which will bring you huge benefits, moreover, it will allow you to acquire other skills, for instance feints with a sword, I personally prefer to work with a spade and a sword (two-handed sword or a “big sword.”) The duel can take different forms while flinging a spear or riding a horse. In case you do not learn basic principles together with a school you belong to, and do not gain dexterity in the handling of the weapons, you are not going to know the true purpose of the sword. You may be practicing delivery 50-60 strikes every day, maybe sometimes even hitting the target, by means of blow displacement, but as a result, this method is not going to bring you much benefit. Strikes must be applied in a correct manner; moreover, ones that are advantageous at one time or another. You have to be able to strike in an open way with extended sword hand. Strikes can be delivered in various ways. Trajectory of the strike has to be calculated in a way you can easily release your hand afterwards. 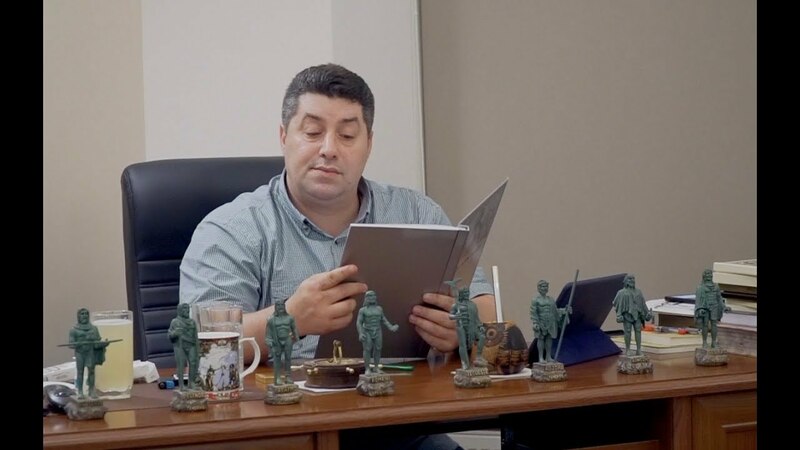 Also, one has to have an understanding how to easily come to the use of a dagger, a broker, gloves, a shield and all kinds of other weapons for means of protection. Pay attention to the extent of highly literate level of Alfieri’s writing, (even from a political point of view!). He does not condemn anyone, does not make claims, but simply takes and trains some young people. And he does not appeal to masters, but to ones who do not yet know the art of fencing. Therefore, as we can see, Francesco was a highly intelligent politician. In his treatise, there is a tribute to all teachers, that is, an expression of respect and praises all those who preceded him, while all those masters had no relation to him. 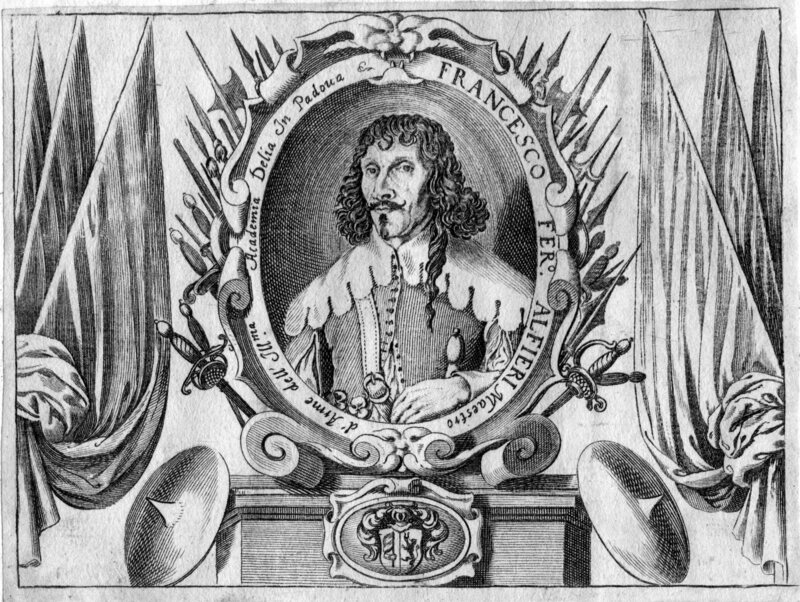 Francesco Alfieri is found of many things, even though is was a common case when masters criticized each other and tried to demonstrate superiority of their school over other schools. Accordingly, when he had been writing on a certain subject matter and when he was expressing his gratitude to someone, everyone believed that this is all part of their merit, which was the reason behind everyone has accepted his ideas with pleasure. Francesco Alfieri had formed his book in exact manner. In fact, the treatise he wrote is analytical one, i.e. analysis of fencing. Moreover, the book is the diadem of Italian fencing, and to understand this it is enough to study the treatise itself. In essence, he had defined the features of Italian fencing, in other words he had shown the way it differs from all other schools of fencing. And the first thing he showed was a universal position. Alfieri took four combat positions, which were the most popular in Italy, and introduced his fifth universal combat position, which, he believed, superseded all these previous ones. In fact, he brought everything together and came up with a new, better fencing position. At the same time, he emphasizes that it would be useful to know those 4 combat positions that other masters introduced before him. It has to be pointed out that, Francesco Alfieri’s position is maintained to this day, and is used very often in effective combat systems. 1. Attack is equal to defense. There is no differentiation between an attack and defense, there is no separate parry. In fact, we are dealing with a straight line. The enemy will miss but we will get him. This is done with the knowledge of the structure of the sword and the ability to work with a wrist, as well as knowledge of controlling opponent’s sword. 2. Blocking the opponent’s hand with a sword (with a free hand). This is not practiced in other forms of fencing. 3. Blocking the sword by hand. When an enemy makes a prick, his sword is “fed” by a glove, then enemy’s sword slips and goes past, and at that moment one may deliver strikes with the other hand. Francesco describes the mechanisms of the body movement or the mechanisms of setting the enemy in a position where you can deliver a strike, but he cannot. Moreover, this is done while working with a straight line and not at the angle. 4. A strike while rotating. There is much description of “column” technique, torso swings. The sword goes by and one delivers a strike while “turning”. There is a demonstration of disarming. 5. Strikes under the sword of the enemy. 6. The opposition of the sword to dagger. The dagger is shorter than a sword, so the dagger is parried by a sword thrust. Since a dagger does not reach, the sword strike is delivered in the direction of a dagger. Simultaneous parry with a dagger and a sword. 8. Strikes with a dagger and a sword at the same time. 9. There are almost no cutting and chopping strikes. The blows are mostly “penetrating, punching” ones. 10. Mixed combat position with a cloak and a sword. The cloak against a sword in order to remain with a cloak and a sword against a defenseless man, and then have a possibility to kill him. 12. Throwing a cloak unto the sword. 13. Winding the cloak on the arm as a shield. 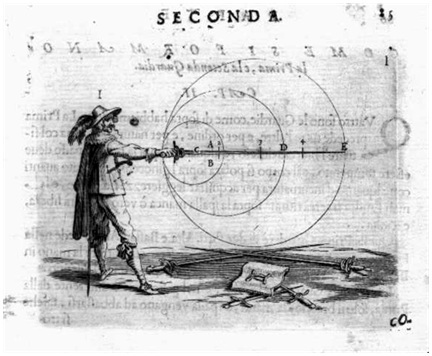 After this classification, Francesco Alfieri moves to fencing with a two-handed sword, which analyzes the features of the weapon by ending the book. Thus, we see that Francesco has determined the boundaries of Italian fencing in history. In fact, he had provided the definition of Italian fencing, which was referred to by others later on. He did not eliminate other fencing positions used by Italians, but simply introduced his 5th universal position. If we take German and French fencing schools, we will see that they are accustomed to sword strikes. And for many centuries they did not prefer to apart themselves from the concept of “blow with the sword.” Note that you do not see these technical elements in the work of Alfieri, because an Italian technique is quite “compact”. It is much faster in attacking (Fig.5) than in swings and strikes, as these elements easily parried. In this case, Italians and in particular Venetians and masters from the Northern Italy did prefer “smart fencing”, their attacks were rational and highly accurate. And the technique, proposed by Francesco Alfieri generalized the entire Italian technique in one treatise, turns out to be the most effective in comparison with all others, because it requires less effort and much more faster. After all, when one constantly attacks he has got an advantage over the opponent and does not get tired. It is enough to attack the enemy, and the attack will follow. Therefore, when people tried to counter this technique with some other, for example the technique of chopping blows, they have invariably suffered defeat. And if a person does not want to be killed, then he is forced to constantly keep his sword in front and defend himself, after which there is a blockage of the hand and a strike. And this is a section of technical elements only, and within these sections you can find a large number of variations of application of these elements. It is worth noting that Francesco Alfieri singled out his own “mixed fighting position of the author” (Fig. 8). This is not a controversial, but a convenient position to performing all tricks and use the force, it is designed to parry, strike as well as many other additionals. For instance, one may limit an opponent, and make the position dominant and inflict a thrust, and prevent a directed thrust of an opponent. Consider the fact that Italians parry with a dagger, thus creating an advantage, but they do not use it as frequent in the delivery of the blows. The Spaniards, on the contrary, always meet a strike with the sword, following with an insertion of a dagger, lead off the sword and remain with a dagger against the sword. 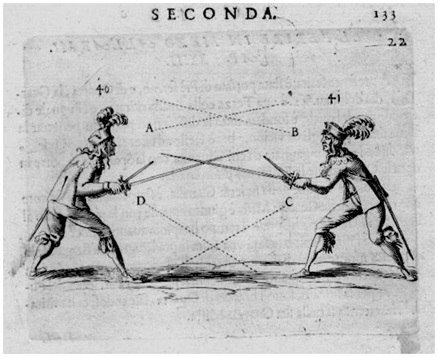 Although the Spaniards can oppose thrusting strike with a dagger as well, Italians have a dangerous dagger technique, as they can take any blow with the dagger and confront it with a sword, except for thrust (Figure 4) which makes it very dangerous. To add, pay attention to the typical Italian cloak work, which has its own characteristics, such as throwing a coat on a sword. Italians give their preference to a thrust, in other words direct piercing strike, and not a cutting and chopping ones (although they exist in their technique as well). The reason behind this is that Italians consider “penetrating” strikes (piercing ones) to be the most rational ones, the most effective and dominating ones in comparison to other types of strikes. Cutting and chopping strikes are more dangerous for an attacker as when one is about to form this strike, he gets counter attack to a hand or body almost at the same time. And the principle of the attack equals to defense, which is not practiced by any other school. As we all know, the art of fencing is mastered through a demonstration. To sum up, we can say that Francesco Alfieri was an outstanding scientist, a politician in the art of war; a man who had defined the shape of Italian fencing and is remembered by all as a master who made a great contribution to the history, science and art of fencing. Owing to Alfieri today it is possible to distinguish Italian fencing from other ones.